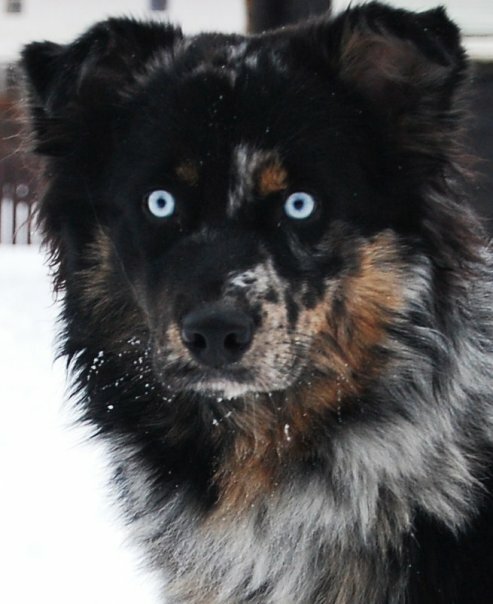 It is always interesting to see dogs with unusual eyes, color, hair textures, mustaches and markings. Genetic mutations and rare conditions are mainly the reasons for their unusual look. However, no matter how unusual dogs may look, they still never fail to make you go “aweee”. Here are some of those strange yet familiarly adorable canines. This breed comes from Hungary. The Rastafarian dreadlocks make it look unusual. The main role of this dog is herding livestock. Facebook’s CEO Mark Zuckerberg and his wife have a puli, name “Beast”. With his mop-like hair, this dog is a real celebrity. He has his own Facebook page with more than 2 million fans. According to his Facebook profile, he likes cuddling and herding things! The color of this dog makes it unusual, and the size of the body is longer than its height. The muzzle is straight and strong, and the coat is moderately thick and long. This breed is a native of China in which the mother was just an ordinary dog roaming in the countryside of Yancheng. It was crossbred with a dog in the neighboring Beijing. 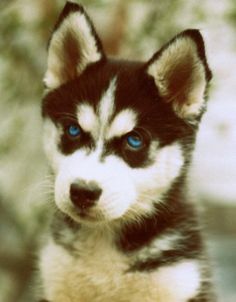 The blue eyes of this dog make it famous. 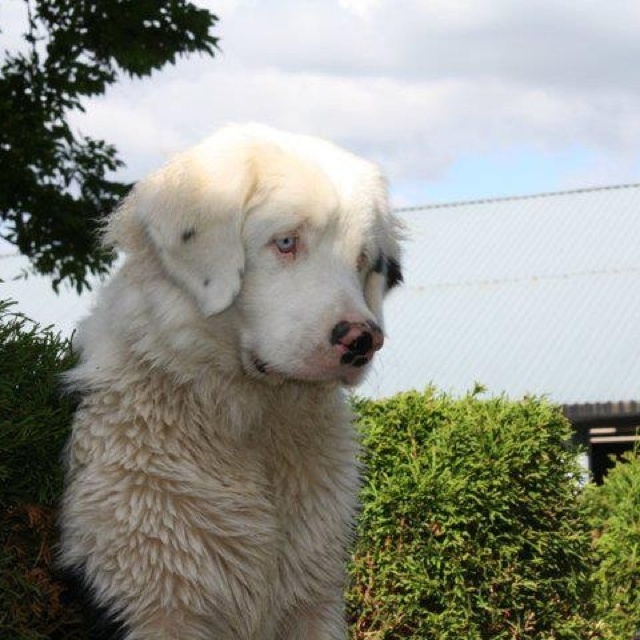 It’s a characteristic that was carried from the genes of Blue Merle. Some dogs may have both blue eyes, while others may have one brown and one blue eye. This is a breed of herding dog that is the rival of the Border Collie. It’s an intelligent dog and fearless in fights with other breeds. As this dog matures to about 25 pounds, it can bravely fight with larger predators like wild boars. This puppy looks like it has a mustache. How cute is that? This is what the puppy looks like when it has grown up. 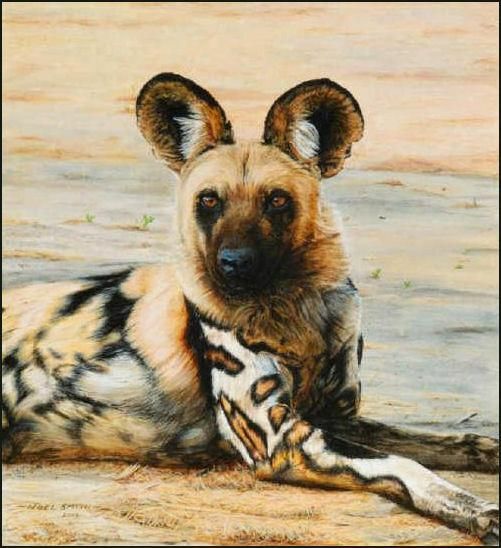 It is a wild dog that is used for hunting. This long-legged breed typically roams the woodlands and plains of sub-Saharan Africa. As the name implies, the coat of this canine seems like it is painted. The mottled, irregular coat has patches of yellow, white, brown, black and red fur. 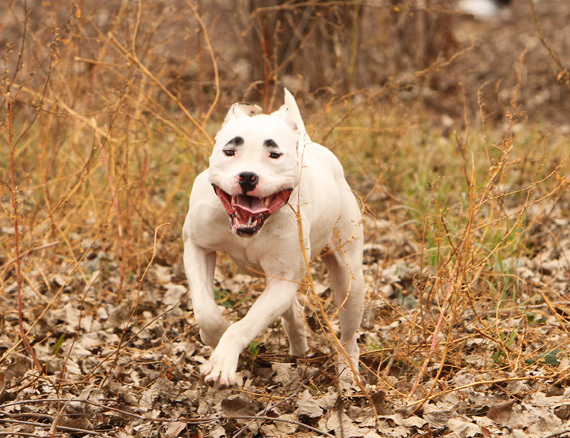 This is a two-faced breed of dog in which the condition is caused by gene mutation. However, no one can argue that it isn’t still adorable beyond words. Cute and smart? The eyes of this Alaskan Malamute make it interesting and unusual. Its body is sturdily and powerfully built; thus, it is expected to have a strong stamina. It’s one of the oldest breeds of dog, but its original look never changes. To avoid boredom, this dog should be given a consistent job. This is one of the most unusual looking dogs you would ever see. This breed is commonly spotted with black or brown. The unusual thing is that some have a heart-shaped spot on their heads instead of on their sleeves. The spots of a Dalmatian develop later in life, but the value is higher in the show ring if the markings are well distributed and more defined. 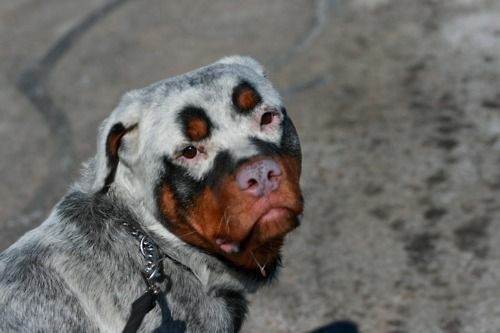 What makes this dog unusual is the spots on its nose and the eyeliner. This breed is very powerful, passionate and shows undying willingness. It is very muscular yet agile. This is a breed of German Shepherd that is piebald colored. The body is very strong and well proportioned. 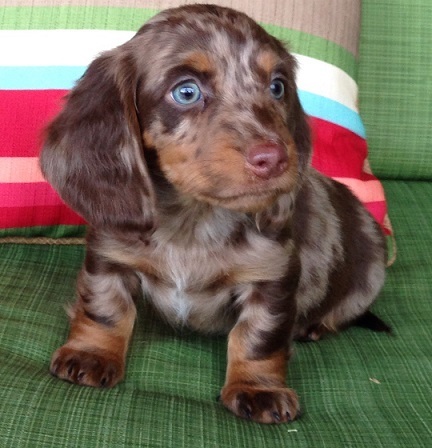 This is the offspring of two wieners with receding piebald gene bred together. The Rottweiler is a powerful and robust dog with substantial build that manifests great endurance, agility and strength. The unusually color of the dog pictured above might be due to vitiligo, a condition that causes the loss of skin color in blotches. 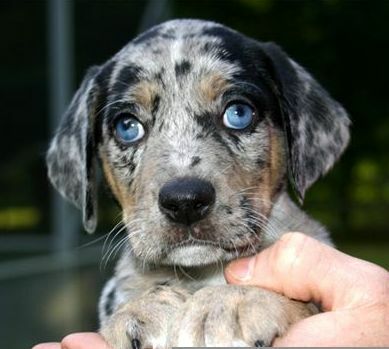 The perfect combination of the spot on the eyes and its color makes this dog unusual. 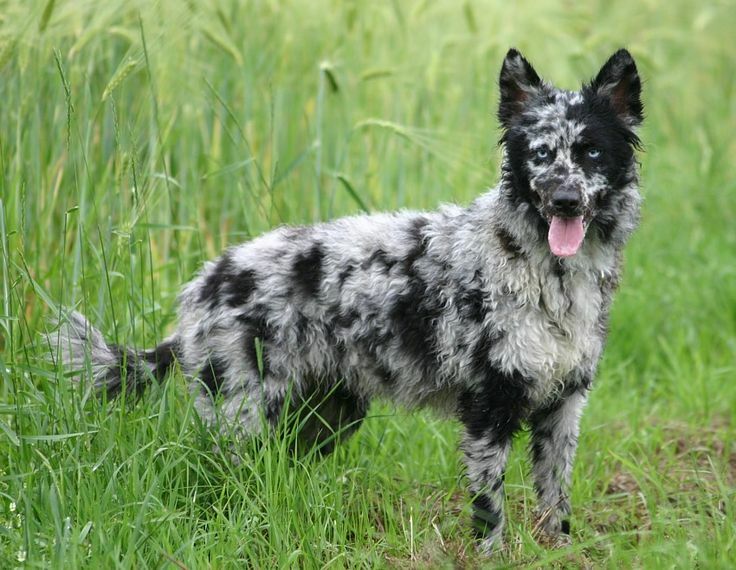 It’s unusual for this breed to have black spots. It is the result of somatic mutation. This one also has remarkable markings on her face. What makes this breed unique is the pinkish hue surrounding the eye sockets. Look at those eyes! This is a species of Merle with a tan and black pattern. The color of this breed is the most notable – not to mention the coarse coat some have, while others have a tight and short coat. This dog looks like a zebra because of the pattern on its coat. There are two varieties of this breed in which one is “hairless” and the other is “powderpuff”.